A time travel murder mystery from a brilliantly original new voice. 'Genre-defying ... Witty and inventive' Guardian. Odette found the dead women at work - shot in the head, door bolted from the inside. Now she can't get her out of her mind. Who was she? And why is everyone determined to cover up her murder? 'Captivating, delightful and thorougly original' Jenny Melamed. 'Troubling and inspiring, comforting and horrifying' SciFiNow. 'Four scientists make a world-changing discovery in this witty debut ... Inventive and unflashily wise about human hearts; Mascarenhas's future promises to be an exciting one' Guardian . 'It offers a diverse cast of characters dealing with thought-provoking issues: bullying, sexuality, love, loss, death, mental health issues, aging and the choices we make' Crime Review. 'A superb novel ... Contriving plot, motive, and opportunity, when time travel and multiple selves are in play, must be head-scratching indeed ... Flawless' Geek Dad. 'A bold and marvellous read. It gives you an appreciation for all things mortal and unknowing and brief' Max Dunbar Blog. 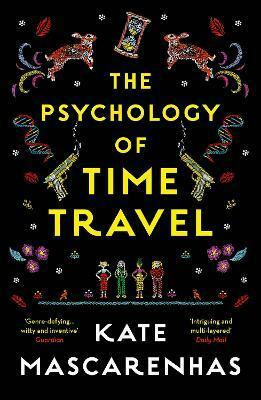 'Mascarenhas has thought through all the mechanics of time travel in dazzling detail, and the question of how sidestepping chronology might transform a person is every bit as absorbing as the central mystery [...] of this ambitious, brain-bending story' In the Moment magazine. 'A hugely entertaining and satisfying read, wrapping your head around the science and psychology innovations is only half the job. The heart of the matter is how, and when, we let friendship and fate collide' Tuam Herald. 'A thought-provoking time travel murder-mystery that will have you guessing to the last' Candis. 'The most imaginative thriller I've read in ages: captivating, delightful, and thoroughly original ... An all-around wonderful novel' Jennie Melamed, author of Gather the Daughters. 'This is a novel packed with ideas ... It'll leave you turning over the concepts in your mind long after the story is finished' SFX. 'A smart, twisty murder mystery ... Troubling and inspiring, comforting and horrifying, this is crammed with the kind of ideas that will ruin other time travel stories for you forever' SciFiNow. 'The narrative moves back and forth through time with its almost all-female cast meeting their future and past selves in an intriguing, multi-layered mystery that is ingeniously plotted' Daily Mail. 'Four scientists make a world-changing discovery in this witty debut ... Inventive and unflashily wise about human hearts; Mascarenhas's future promises to be an exciting one' Guardian. Kate Mascarenhas is a part-Irish, part-Seychellois midlander. Since 2017, Kate has been a chartered psychologist. Before that she worked as a copywriter, a dolls' house maker, and a bookbinder. She lives with her husband in a small terraced house which she is slowly filling with Sindy dolls. This is her first novel.